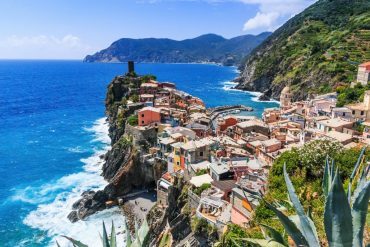 Do you like to have great looking hair even when you’re traveling? Are you fed up with trying to use those dodgey hair dryers in hotel rooms? 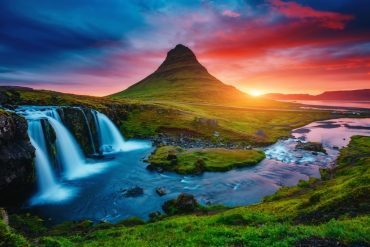 If you answered yes to both these questions, then you are in luck, because in this article I’m going to help you find not only the best travel hair dryer, but the smallest travel hairdryer so as not to weigh you down whilst traveling. There are lots of travel size hair dryer options on the market, but the smallest travel hair dryer is not necessarily the best travel blow dryer. For a good quality travel size blow dryer, you want one that has most of the great features of the hair dryer you use at home, but on a smaller scale. I mean just because you’re traveling doesn’t mean you don’t want great looking hair, right? Of course, like with most things, there is no one size fits all when it comes to an international travel hair dryer. Which is why you’re going to find this article so helpful. 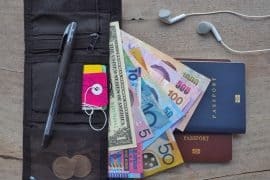 In this guide I cover off on the various features you should consider when purchasing a travel hair dryer, as well as look at specific models for the best travel hair dryer with diffuser, the most compact travel hair dryer, the most powerful travel hair dryer, the best lightweight travel hair dryer as well as a range of other options. Why Purchase a Travel Size Blow Dryer? No doubt the hair dryer you have at home is big, bulky and fairly heavy. 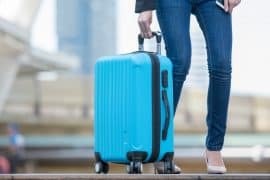 With luggage weight and size restrictions for both checked in and carry on, you really need to travel as light as you can. A heavy and bulky hair dryer is just going to add unnecessary weight to your luggage, so leave it at home. Have you ever used one of those hair dryers in the hotel? They are tiny and powerless, not to mention they are usually fixed to the wall in the bathroom, so you have no choice as to where you do your hair. Plus isn’t it better dry your hair with a hair dryer that you know well to ensure your hair style is on point? Don’t have time to read all the travel hairdryer reviews? 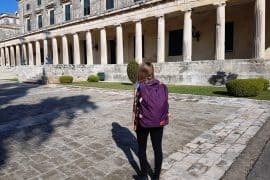 There are some great travel hair dryers in this guide and to be really honest I found it really difficult to choose just one as the best overall – but if I had to choose just one, I’d recommend the Conair Vagabondas the best travel hair dryer overall. 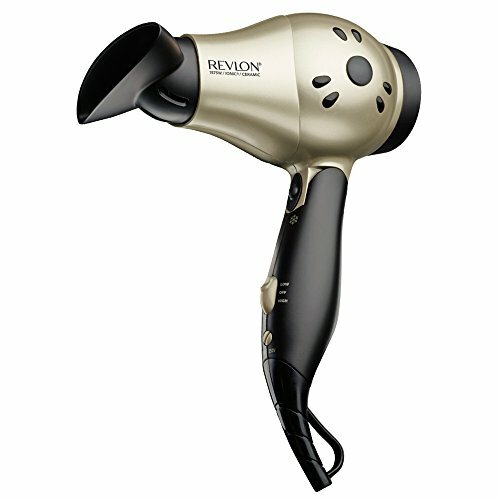 Weighing in at only 1 pound, this is a super lightweight hair dryer, but still powerful at 1600 watts. With its foldable handle, it’s nice and compact and will fit in your backpack or suitcase with ease. Keep reading below for my full review on this hair dryer. The table below provides a great overview of the various travel sized hair dryers reviewed in this guide. You can easily compare their features side by side. Before purchasing a travel sized hair dryer, be sure to do your research and consider the following factors to ensure you purchase a hair dryer just perfect for you. Obviously one of the most important factors when purchasing a travel hair dryer is its size. I mean, if size wasn’t an issue you might as well bring your hair dryer that you use at home. In order to make a travel hair dryer compact they usually have features such as foldable handles or retractable cords. Just don’t be fooled by the name of the hair dryer. Just because it says it’s a travel hair dryer doesn’t necessarily mean it’s compact. Also, just because a hair dryer is super small doesn’t mean it’s any good. I’ve done all the hard yards for you and have only included hair dryers in this guide that are both small yet powerful enough to get your hair looking great. I’ve also included the actual size of each hair dryer in the table above for your convenience. The weight of the hair dryer is also an important factor to consider, particularly for plane travel. 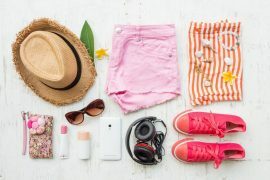 As mentioned above., there are weight restrictions for luggage, whether its checked in luggage or carry-on baggage, so you don’t want to waste your precious weight allocation on a heavy hair dryer – even if it is compact. Again, don’t be fooled that just because it’s a compact hair dryer that it’s the lightest travel hair dryer. You would be surprised to know how heavy some of those compact hair dryers can be. Once again, I’ve done all the hard yards for you and have only included hair dryers in this guide that are both lightweight and powerful. I’ve also included the actual weight of each hair dryer in the table above for your convenience. Now one of the main reasons I recommend bringing your own travel hair dryer as opposed to using the ones provided in the hotels is due to how powerless the hotel hair dryers often are. In order to blow dry your hair quickly you need a hair dryer with a high wattage. If possible, I’d recommend getting one that’s 1875 watts for maximum power. I’ve also included the wattage of each hair dryer in the table above for your convenience. Despite wanting a lightweight and compact hair dryer, you certainly don’t want to compromise on its features. One of the features of a hair dryer that’s gets your hair looking fab is its attachments. Most hair dryers come with attachments such as a concentrator nozzle or a diffuser. If you have curly hair, a travel hairdryer with diffuser is essential. Whilst unfortunately this will add bulk and weight to your travel dryer, its unavoidable for gorgeous looking curls. For perfect looking hair, you’ll want a hair dryer with adjustable settings. Unfortunately, small travel hair dryers are usually limited to their settings, but some include either adjustable heat and / or speed settings. Also consider an ionic hair dryer. An ionic hair dryer creates smoother hair as it dries with moisture from the air. 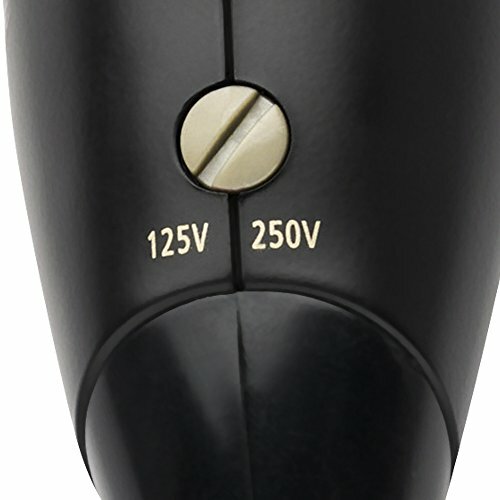 One of the most important aspects of all when it comes to a travel hairdryer is voltage. The correct voltage is not only essential to the operation of the hair dryer but the safety of it. Different countries have both different voltage and wall attachments, and you will require the correct converter to use your hair dryer safely. Ensure the hair dryer you purchase is dual voltage, which means it can function in various countries with different electricity types. 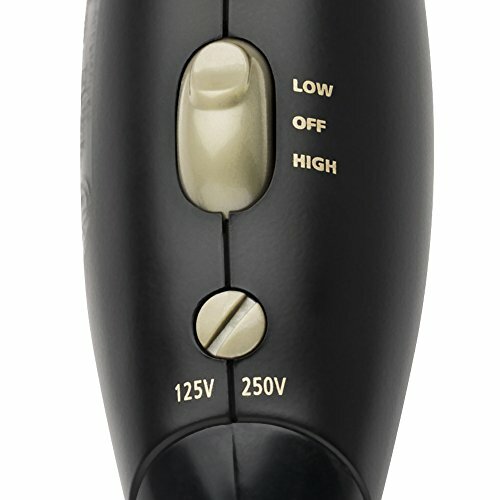 A dual voltage hair dryer has two voltage options. 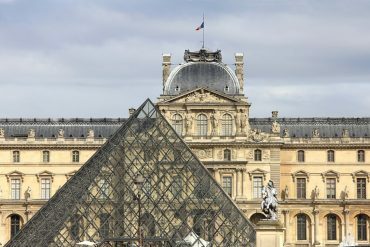 If you want to be extra safe overseas, keep it on low versus high power when in use. 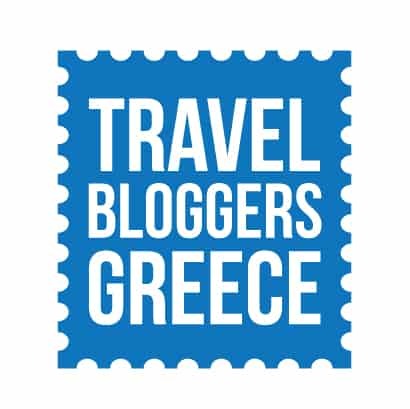 Also don’t forget your travel adapter! 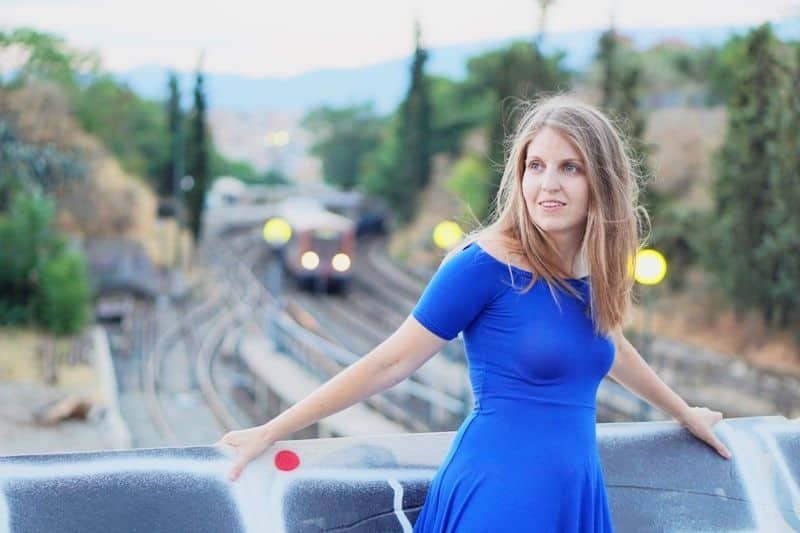 There are some great travel hair dryers in this guide and to be really honest I found it really difficult to choose just one as the best overall – but if I had to choose just one, I’d recommend the Conair Compact as the best travel hair dryer overall. 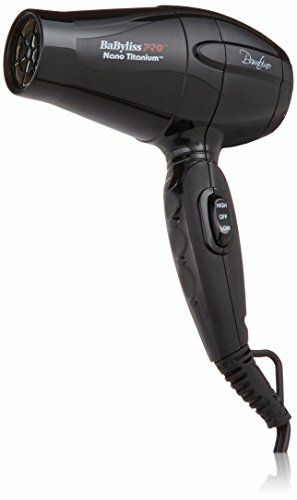 It’s not the lightest, smallest or most powerful, but it does a great job of balancing all these features out to provide a great hair dryer for travel. 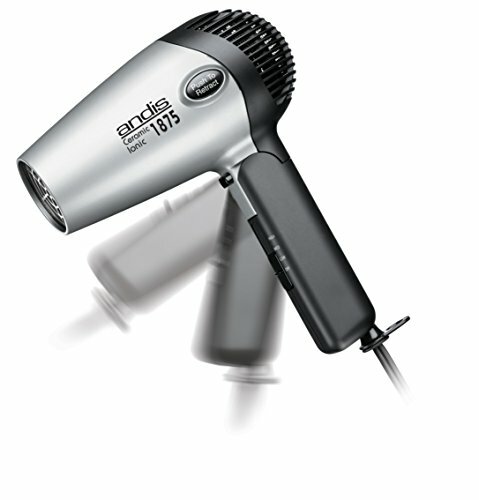 Weighing in at only 1 pound, this is a super lightweight hair dryer, but still powerful at 1600 watts. With it’s foldable handle, its nice and compact and will fit in your backpack or suitcase with ease. With the 5-foot cord, you’ll be able to have great looking hair no matter where the power plug and mirror is in your hotel room. The hair dryer also has dual voltage so it’s perfect for overseas travel and also features 2 heat and speed settings. Coming with a 1-year warranty, this compact, yet powerful hair dryer by Conair is an easy choice. 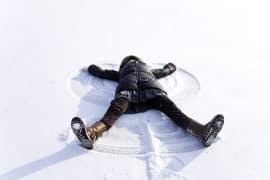 Click here to read more reviews or to check the current price. For ladies with gorgeous curls, you can’t go past this travel hair dryer with diffuser attachment by Hot Tools. Whilst at 1.6 pounds, it’s certainly not the lightest travel hair dryer, but that is to be expected when it includes attachments such as a diffuser and concentrator nozzle. However, it has a folding handle which makes it nice and compact. This 1875-watt hair dryer comes with some great features including ionic technology to help reduce static and frizz. Other features include dual voltage, two heat and speed settings as well as a cool shot option. If you’re in need of a hair dryer with diffuser attachment, you can’t go wrong with the Hot Tools hair dryer. If you just want the best smallest travel hair dryer you can get your hands on, then look no further than the BaByliss Pro Nano travel hair dryer. Whilst it might not be the most powerful travel hair dryer, it is certainly super compact and will fit nicely in the smallest of suitcases. Weighing in at only 0.6 pounds, it’s not only the smallest hair dryer in these reviews, but also one of the lightest. It also has a foldable handle making it compact too. Whilst this hair dryer is only 1000 watts, it has plenty of great features to make it a great travel companion. It also is dual voltage (so prefect for international travel), comes with a concentrator nozzle, has 2 heat and speed settings and a removable rear filter and stand for easy cleaning. Coming with a 1-year warranty, this tiny hair dryer by Babyliss is an easy choice. 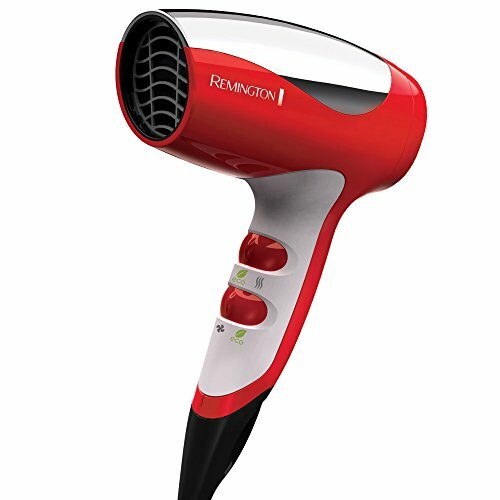 For the frequent international travelers, the Revlon Compact Travel Hair Dryer is a worldwide dual voltage dryer with a triple ceramic coating and ionic technology to reduce frizz and damage. Great for dry and brittle hair, it locks in moisture to your hair while drying it, leaving you with smooth, soft and silky hair. It is suitable for use on all hair types, with 2 heat and speed settings and a cool shot feature, and it distributes the heat evenly. This dryer also come with a smoothing concentrator attachment and removable filter cap. At 1.28 pounds, it isn’t the lightest of travel hair dryers, but it is still lightweight. The foldable handle means you can fit into any sized luggage, even your gym bag. For a dryer that is incredibly lightweight and fits in the palm of your hand, try the MiniPRO Conair Travel Hair Dryer. Weighing in at only 0.68 pounds, it is a powerful 1200-watt dryer that will quickly yet gently dry your hair. The 5-foot power cord lets you use it all around the room while the dual voltage allows it to be used all around the world. The handle has a lovely velvet touch grip for comfortable styling, and it folds down, so you can stash it in your gym back or store it in your luggage without hassle. The Tourmaline Ceramic Technology emits natural ions that will help reduce frizz and bring out natural shine, while the infrared heat gently dries hair fast. The 2 heat/speed settings mean you can use this dryer with all hair types and the bonus concentrator will help with pinpoint styling. 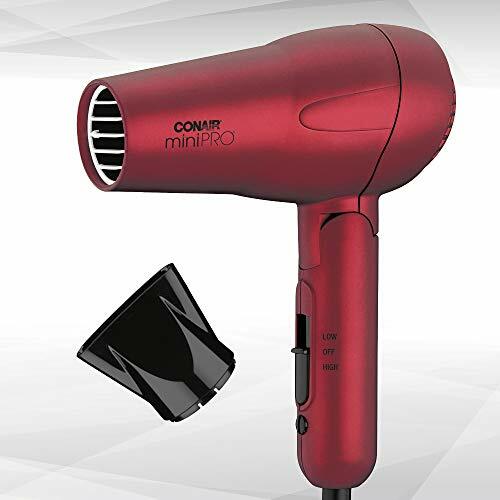 If you’re looking for a travel hair dryer that has all the drying power of a traditional hair dryer, but without the weight, here she is: the MiniPRO Conair Travel Hair Dryer. The Conair Vagabond Compact Travel Hair Dryer is so powerful that you could even use it as your main hair dryer at home. You’ll be able to feel the power of the 1875-watt as it dries your hair super-quick. This, along with the dual voltage switch, foldable handle and light weight of 1.2 pounds, makes it one of the top travel hair dryers available. Featuring 2 heat/speed settings to suit your hair type and a cool shot button to lock in your style, this hair dryer does a fantastic job of keeping hair smooth and frizz-free. The 5-foot cord gives you plenty of freedom to move around in front of the mirror. 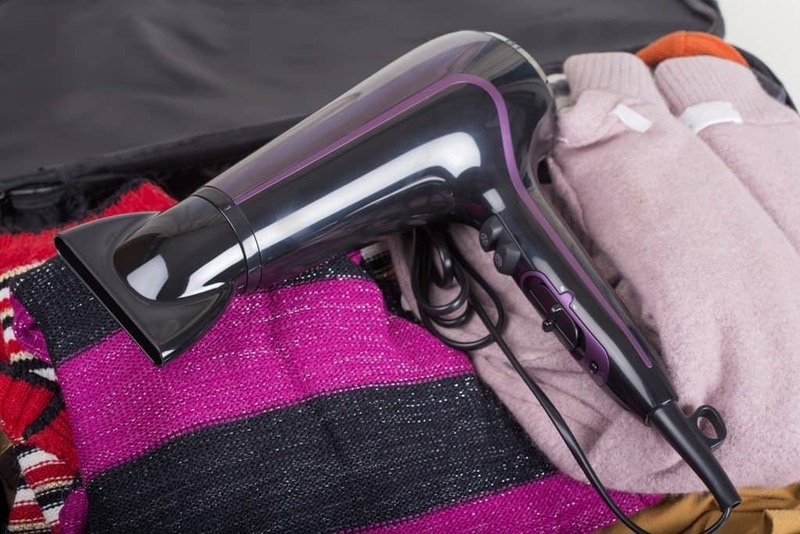 The Conair Vagabond Compact Travel Dryer is transportable, compact and very powerful. The Remington Ionic D5000 Travel Hair Dryer is a compact yet powerful 1875-watt hair dryer that has all the features of a traditional hair dryer. Unlike other travel hair dryers, this travel dryer has 3 heat settings – eco (cold), medium and high. Small but mighty, with a high-performance motor and fan, the Remington Ionic weighs under 1 pound. There are 3 heat and 2 speed settings to choose from, both with an energy-saving Eco option. The Eco option blows cold air and lowers the fan speed. 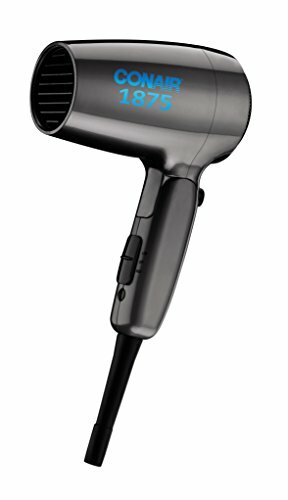 This is great for those that like to use cold air to dry their hair, without having to hold down the cool shot button. In saying that, this dryer also has a cool shot button! The ionic technology blows the hair with negative ions for reduced frizz and anti-static shine. The angled barrel makes movement around your head less awkward. The hang-up hook will keep your travel dryer tidy and out of the way when not in use. 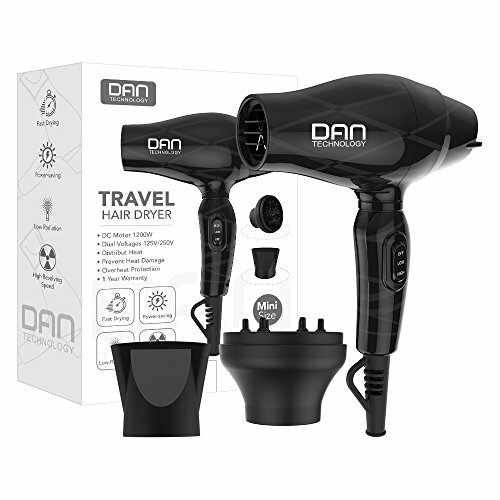 This small but powerful 1200-watt DAN Technology Compact Travel Hair Dryeris the size of your hand and weighs only 1 pound. 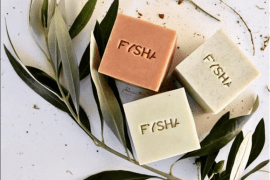 It will gently dry your hair gently without causing any damage. The dual voltage makes it useful for overseas travel, as it can be used in almost any power socket without being overloaded. The 2 heat/speed settings make this travel dryer suitable for use on any hair type – use the high heat for thick hair, and the low heat for thin or damaged hair. With the ever-useful concentrator nozzle and diffuser attachments included, a removable filter for easy cleaning, and a 5-foot power cord and hanging loop, it’s a handy and practical little hair dryer for on-the-go travel. The Andis Ionic Travel Hair Dryeris the only travel hair dryer on this list with a retractable cord. It also has a folding handle making it incredibly compact. This ionic hair dryer dries your hair quickly by breaking down the water molecules and it seals the moisture into the hair without taking away the natural oils. The ionic and nano-ceramic technologies reduce the frizzies while conditioning your hair, leaving smooth, silky and shiny hair. It evenly distributes the heat and comes with 3 heat/speed settings making it suitable for all hair types. Also included is the cool shot button to lock in your style. 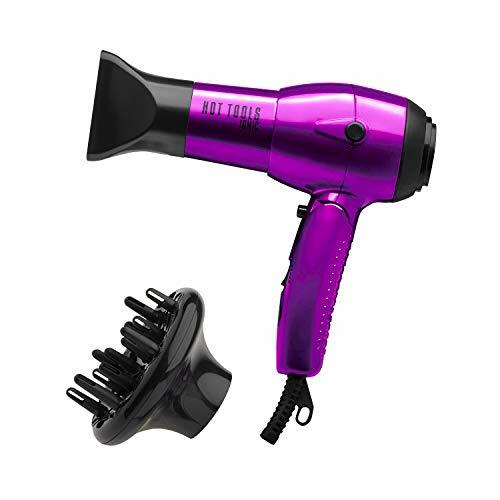 Coming with a concentrator attachment, lifeline shock protection built into the unit, and an amazing 5-year warranty, the Andis Ionic Travel Hair Dryer is a great investment. The only negative aspect is the fact that it is not dual voltage, so you will need to take a voltage convertor with you when traveling. 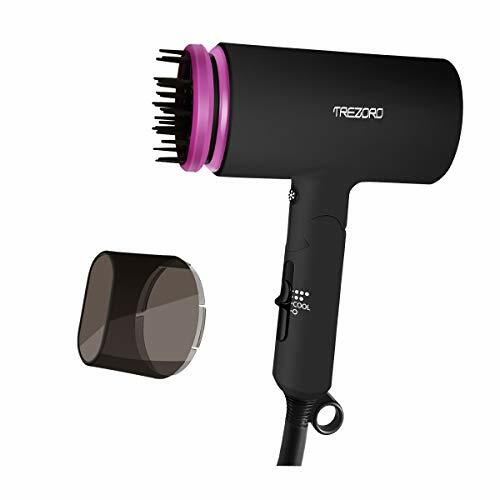 Another great choice for travelers needing a hair dryer with a diffuser is the Trezoro Portable Folding Travel Hair Dryer. Slightly larger than the other travel dryers in this review, it weighs 1.6 pounds, but it more than makes up for this by giving you beautiful hair! With a fast and quiet high-end 1500-watt motor, 3 heat/speed settings and cool shot button and a folding handle, the Trezoro will become your carry-on hair stylist. You’ll get beautifully soft and shiny hair when using this hair dryer due to the combination of built-in high-level ionizer and ceramic tourmaline technology. The ionizer neutralizes static and reduces frizz, while the ceramic tourmaline locks in 90% of the hair’s natural moisture. The Trezoro Portable Travel Hair Dryer comes with a concentrator nozzle and air comb/diffuser for those with thick or curly hair. This is a highly rated travel hair dryer and certainly worth considering. Next articleCan Hotels Track Your Internet Usage?